There's a reason why Philip C. Stead won the Caldecott Medal for A Sick Day for Amos McGee. His illustrations are fantastic! 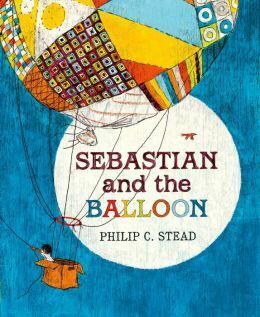 And Sebastian and the Balloon is another imaginative work of art that kids will love. When Sebastian gets bored, he builds a hot air balloon out of his grandma's quilts, and his imagination floats away! Along the way, he meets many new friends, including a "real bear." The text is simple and perfectly matches the colorful, textured illustrations. I love books that encourages kids to use their imaginations, and this one does just that. It is sure to be a classic for years to come. Just a quick fact check: while Phillip's illustrations are wonderful, it is his wife, Erin Stead that won the Caldecott for Amos McGee, a book he wrote for her.